The problem is, the report is not the audit it was promised to be, and is scant in detail. It doesn’t yet have basic field-by-field production data, though this has been promised, and the KRG has yielded it up at short notice before. Oil payments are lumped together by month, as is oil production and other data. A note to the report states that all “oil export, consumption and revenue data are based on the records held by the KRG,” rendering it unsurprising that no discrepancies were found. A senior KRG official involved in the exercise admitted that the report had been progressively generalised to accommodate disclosure concerns, including from the region’s oil buyers. Contrary to prior promises, there was no civil society engagement in the report. Over a third of documented spending for the period – c.$700 million of c.$2 billion – went on “payments made to third parties on behalf of the KRG,” whatever that means. This class of spending is so vague as to compromise the seriousness of the exercise. The Deloitte report is the latest example of the KRG’s inconsistent and self-serving approach to transparency in its oil sector, in which the region’s Ministry of Natural Resources (MNR) has typically played and outsized and political role. Bouts of oil sector reporting, even when comprehensive, have typically petered out into renewed silence within a few months, variously due to resource incapacity, institutional paranoia in the context of opposition to independent oil policy from Baghdad, and a casual attitude to oil transparency. Interactions with large international oil producers and trading companies have also to some extent forced secrecy on the KRG. It was supposed to be very different. Shortly after the KRG formed a unified Ministry of Natural Resources under Ashti Hawrami, the region’s first and only oil minister, the regional parliament passed an oil and gas law in 2007, the same year when the KRG’s oil contracting boom got under way. Most of this never really happened. None of these public bodies, to any practical extent, exist. It was the first in a series of patchy, abortive efforts at public reporting. 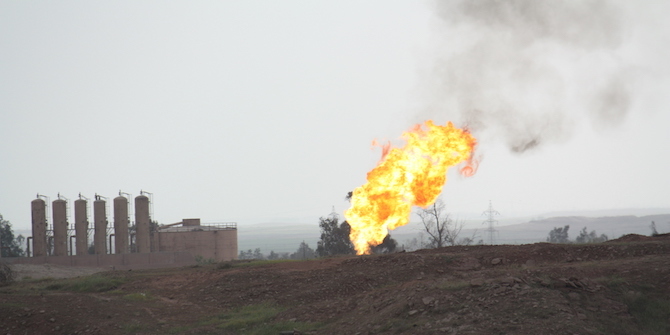 In September 2011, the KRG released almost all its extant oil and gas Production Sharing Contracts (PSCs). The contracts are in English, and are recondite things for all but specialists to read. Some important contracts remain confidential, but it was a promising step. But after ExxonMobil entered the region a month later, no new contracts were disclosed. Having failed to persuade the Extractive Industries Transparency Initiative to give the KRG a report of its own, in 2012 the MNR set about politicising the Iraq reporting process, and short-circuited the audits. World Bank and EITI officials confessed exasperation that a simple and technical exercise was being manipulated. Eventually, the EITI reports for 2010 and 2011 had the KRG entries scrubbed. The MNR blamed “political manipulation by some officials in Baghdad,” and promised to set up a “full and uncensored” EITI reporting process of its own. The Deloitte report, five years later, is the first effort. In the years that followed, the MNR would sporadically publish reams of oil sector data – on oil trucking, production, refining, exports revenues – only to drop these reports after a few months. Absurdly, the ministry claimed to be transparent while disclosing major oil developments annually in The Oil and Gas Year, an advertorial published in English that, outside oil conferences, costs $225 a copy. Patchy disclosures, even when comprehensive in their own right, have failed to provide transparency on the KRG’s oil management. As a result, they’ve also failed to instil public or political confidence in the probity of the KRG’s oil policy or administration. This matters, not just because oil transparency mitigates the ill-effects of natural resources on societies, but for the particular and immediate challenges facing the KRG after three years of overlapping crises, culminating in the Kirkuk debacle in October 2017. On 8 January 2014, the KRG’s Ministry of Natural Resources (MNR) announced that oil exports would begin by the end of the month. Potential buyers were directed to the Kurdistan Oil Marketing Organization (KOMO). But KOMO was not real: there was no trading desk run inside the region. Instead, the email address supplied in the statement by the MNR – KOMO@mnr.krg.org – auto-forwarded to the MNR’s communications adviser. In response, then Prime Minister Nouri al-Maliki cut the KRG’s share of the budget, sparking a severe fiscal crisis. The KRG began taking large advance payments for oil deliveries from international oil traders in 2014, making the region almost entirely dependent on these major trading companies (principally Vitol, Trafigura, Petraco and later Glencore and Rosneft). It has also made an understanding of the account balances with these traders the most important single metric of the KRG’s financial health as a de-facto fiscally independent government. The KRG has never given a proper reckoning of where it stands with these traders, though at times it has provided detailed information. From April 2015 until mid-2016, monthly export reports catalogued daily pipeline exports, loadings to named oil tankers, and specific payments from (unnamed) oil traders. With these reports, the KRG was briefly the most transparent major oil exporter in the world. Those reports abruptly ended in mid-2016, and were replaced with inconsistent one-page summaries. These in turn ended in October 2016, ostensibly because the KRG was going to shortly start producing monthly audited reports. It has taken over a year for the first of these – the Deloitte report – to arrive. The regional parliament has provided for an oil revenue accounting board, but this has not been formed, much less published the monthly public accounting it is mandated to produce. Apart from the Deloitte report, from October 2016 until now the KRG has failed to provide routine disclosures of the most general summary data about its oil production, exports or revenues. Further data is on the way, including more Deloitte reviews, and an Ernst & Young review of capacity-building payments gleaned over the years from the region’s oil contracts. But for now, the KRG is one of the world’s most opaque natural resource-reliant governments. The KRG’s response to the loss of federal revenue since 2014 was improvisational and chaotic, leaving it with a deinstitutionalised financial system. Previously federal budget money flowed into Kurdistan in two parallel streams, with cash sent to nominated branches of Iraq’s central bank in Erbil and Sulaymaniyah, a legacy from the pre-2005 period of dual single-party administrations run by the Kurdistan Democratic Party (KDP) and the Patriotic Union of Kurdistan (PUK). From 2014, oil exports were handled by trading houses through a contracted intermediary. Petrodollars flowed to banks in Turkey, and later Switzerland. The KRG somehow turned these into cash dinars in the wake of central bank sanctions resulting from the seizure of billions of dollars to pay salaries. The defenestration of Gorran party ministers from a unity cabinet in October 2015 put oil and revenue management almost entirely into the hands of the KDP, when the roiling crisis over the regional presidency reached its peak. Privately, senior PUK officials overseeing a party in turmoil said they couldn’t trust how the oil sector was run. The political splintering of the region is as acute as any time since Kurdistan’s civil war in the 1990s. The parliament hasn’t passed a regional budget since 2013. Even then, budgeting was just a sluice to direct patronage payroll, with the MNR acting as a parallel finance ministry, disbursing billions of dollars from oil contract bonuses. This dysfunction elsewhere puts a particular premium on timely oil transparency at the top, particularly now, when the viability of the region is in question. Unlike far-flung reform programa – such as this one from a 2016 World Bank study – a narrow focus on oil transparency is within the KRG’s capabilities and can quickly improve its standing. As the KRG dusts itself off from years of buccaneering improvisation in the development of its oil sector, the region’s oil authorities should get back to basics. Detailed, consistently-reported oil sector data has an important role in repairing investor confidence, building international credibility and improving what slender chances remain of any kind of equitable settlement with Iraq’s federal government.